There is no greater beauty than the majesty of the Canadian Rockies! Delve into the magnificence of this scenic wonderland where awe-inspiring scenery and fascinating wildlife are everywhere! 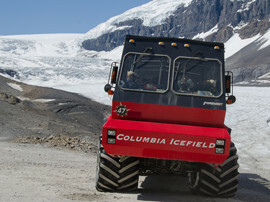 From the emerald waters of Lake Louise, to the imposing cliffs and snow capped mountains of the Rockies, to the unforgettable Icefields Parkway, this will be an incredible journey for the senses. Add to that breathtaking waterfalls, rushing rivers and glacial peaks. Then, brace yourself for the thunder and wonder of the Calgary Stampede featuring a world-class rodeo and grandstand show. 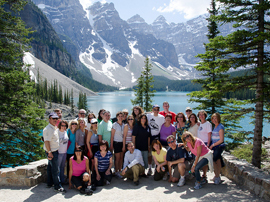 Enjoy the journey with Jewish Singles from across North America and beyond, for a summer trip that’s even better than sleep-away camp! You will love the amazing hotels we have selected for this itinerary, as well! The stunning and iconic Chateau Lake Louise is surrounded by soaring mountain peaks, the majestic Victoria Glacier and a glistening emerald lake. The world-famous Fairmont Banff Springs, commonly referred to as “the castle in the Rockies” has breathtaking views and gorgeous grounds within Banff National Park. 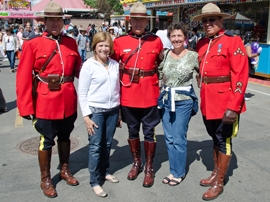 Click here to watch the Canadian Rockies & Calgary Stampede preview video! Looking to add some adrenaline to your vacation? Add on a once-in-a-lifetime experience of heli-hiking to make your vacation truly unforgettable! Click here for more details. A deposit of $350 is due with your reservation. Full payment is due April 11, 2019. These rates are based on an all-inclusive, custom-designed package that differs from offerings seen in public advertising. We are unable to make any of our package components available to anyone who is not part of our Amazing Journeys group. Pre/Post-Tour Stay in Calgary: For those who want to arrive prior to the start of the tour, or stay one day after, we have a limited number of rooms held at our group hotel in Calgary. Please note – there will be no Amazing Journeys staff present nor will there be programming on these days. We are not able to match roommates for extra night stays. Rates include taxes and breakfast. Cancellation Policy: From the time of deposit until January 30, 2019, there is a $75 penalty for cancellation. From January 31 – April 11, 2019, the cancellation penalty is $350. From April 12 – May 31, 2019, the cancellation penalty is 50% of the total package price. From June 1, 2019 until the day of travel, the cancellation penalty is 100% of the total package price. Cancellations made on the day of departure and “no-shows” will receive no refund. There is no refund in the event of interruption or cancellation by the passenger after the start of the journey. Flights and Transfers: Airfare is not included with the tour cost. You will fly into and out of Calgary, Alberta, Canada. Flight perimeters will be sent with your trip confirmation. Transfers from and to the airport are available at the start and the end of the tour for an additional fee. Further details will be provided in the weeks prior to the tour departure. Taxes and Gratuities: Taxes, surcharges, visa fees and government fees are subject to change. Gratuities have been included on this tour. Tips for the local drive, guide, specialty guides, luggage porters and included meals are included in the cost of the tour. Passport and Visa: A Passport is necessary to travel on this itinerary. It must be valid for six months beyond the last day of the trip. At this time, no visas are necessary to enter Canada for those from the US. If you are a citizen of another country, please check the website for the Canadian Embassy to see if a visa is necessary. Please note – visa requirements for Canada are changing quite often. Exchange Rate: If the rate of exchange between the US Dollar and the Canadian Dollar fluctuates greater than 3%, we reserve the right to change the price of the tour. Once final payment is made, the price will not change. "I love traveling with AJ! I have seen the world, met amazing friends, and best of all, they take the stress out of traveling."